Our solution Azure Clinical Long Term Archiving by STATUS is set to address these challenges with a centralized archiving system that is efficient, scalable, and able to enforce security and retention policies, a system that can be quickly deployed and managed without losing sight of your budget. Complete patient history and medical profile. Storing and organizing data from different sources (medical equipment, healthcare applications, etc. ), with enhanced capabilities of data mining and statistics achievement. Centralized enterprise-wide management of any type of clinical data. Long-term preservation, automation of retention and compliance policies ensuring legal, regulatory and industry compliance; enforce retention rules based on a records retention schedule, record-holds and enforced disposition if needed. STATUS is designed to take the interaction between patient and healthcare industry (doctors, healthcare providers and insurance companies) to the next level. Every role inside our solution has been carefully design and developed by our experts using real-life scenarios and all the features are constantly updated based on the feedback received from our customers around the globe. As a Patient you get a reliable place, always available online and always connected with you through mobile devices, to access your health status and define and track your medication. You can update your medical profile, search for the best doctors, interact with them using a secured and user friendly interface and review the quality of medical services. As a Doctor you get quick and user friendly access to patient’s health information and have the possibility to record information about your patient (photo, audio / text notes and video) even while you are consulting. Also, you can promote own work and receive feedback from patients. As a Health Service Provider you can update your patient virtual medical file with laboratory test results, medical reports, imaging analysis data, etc. Also you have a great tool to provide claims related information directly to the Insurer and get an image of the medical system from the patient’s viewpoint. As a Health Insurance Provider you can provide your customers with accurate information about their medical claims, customized insurance package based on their medical history and quickly process claims from health service providers for fast reimbursement. Moreover you can develop value added services to the customers in order to build loyalty and create new revenue streams. 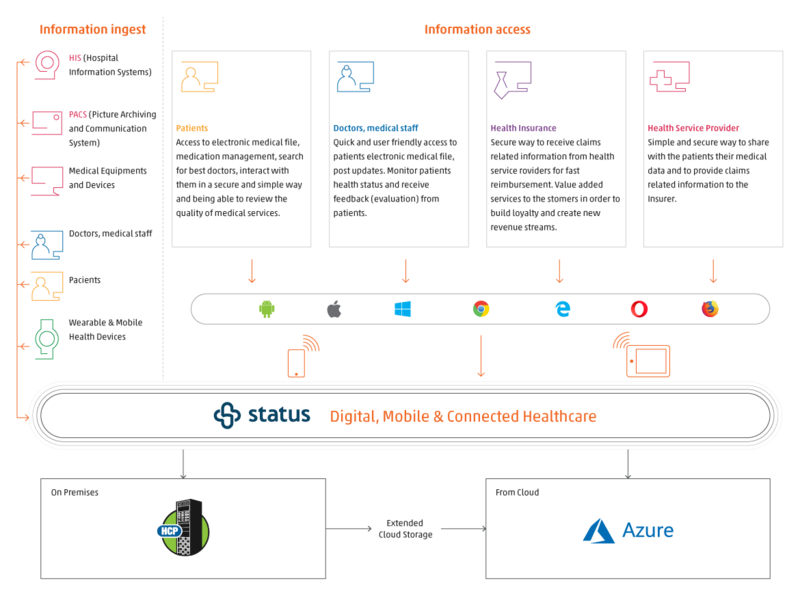 We developed STATUS from the ground-up to leverage the true potential of a mobile healthcare application delivering world-class services built to scale - on your desktop, tablet, and smartphone. Using dedicated iOS and Android extensions, healthcare records are now available anytime from any device. Doctors, healthcare service providers and health insurance companies are now connected in real time, sharing information, offering second opinions and delivering better medical services, even without patient’s presence. All medical records are in one place with secured access whenever needed using mobile devices! Enables hospitals and practices to store their clinical data flexibly and inexpensively on a long-term basis. Provides an opportunity to securely share medical data with colleagues, inside and outside (e.g. second opinion) the organization, duplication being avoided. No capital investment, data is stored securely on Azure in multiple locations around the world.